14. The most comprehensive Holocaust research center in Ukraine and perhaps in all of the post-Soviet states is Tkumah, the Dnipropetrovsk-based Ukrainian Holocaust Research, Education, and Memorial Center. Directed by Dr. Igor Schupak, Tkumah is currently housed at the local hesed (welfare center sponsored by the Joint Distribution Committee), Hesed Menachem, in the center of Dnipropetrovsk. Dr. Schupak and his colleagues are eagerly awaiting the day when they are able to move into the Menorah Center, a facility that will accommodate their research needs, library, classrooms, and the Museum of Jewish History and Culture in Ukraine. Museum premises will include a large hall of multimedia displays, a memorial space, and a center designed specifically for children and families. Creation of the new museum and education institute in the Menorah Center was proving to be a “gigantic” project, said Dr. Schupak. The museum, he continued, would be a gallery of life, destruction, and rebirth, that is, of Jewish life and civilization before the Soviet Union and the Holocaust, the destruction during the Soviet period and the Holocaust, and rebirth of Jewish life after the collapse of the Soviet Union. Only in Dnipropetrovsk, which Dr. Schupak considers the strongest Jewish community in the post-Soviet states, could such a museum be developed. Among all the rabbis in the region, Dr. Schupak continued, only Rabbi Kaminezki could bring together the financial support for this project. Notwithstanding the enormous amount of effort required to establish the museum, said Dr. Schupak, Tkumah continues with its conventional work. These tasks include research on the Holocaust; work with schools, teachers, and students; conferences; publications; collaboration with Yad Vashem and other Holocaust-related institutions abroad; monitoring antisemitism; and special events. Regarding the last-named, Dr. Schupak said that both the Ukrainian national government and Dnipropetrovsk oblast authorities are very eager to commemorate the 70th anniversary of the beginning of World War II and the Holocaust. Under the direction of Tkumah, such commemoration will include a scholarly conference with numerous specialists from foreign countries (including Israel, Germany, and Poland) to be held in Kyiv, roundtable discussions and other events in various Ukrainian cities, tributes to World War II veterans, and participation by high school students in certain creative work related to World War II and the Holocaust. 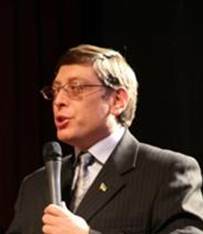 Dr. Igor Schupak is a frequent speaker at Holocaust-related events, including a 2011 conference in Lviv at which the photo at right was taken. In addition to his responsibilities at Tkumah, Dr. Schupak also is volunteer director of programming for Limmud in Ukraine. He was preparing for “Limmud Tkumah”, which will take place in Vinnytsia in June. Vinnytsia was chosen as the site, said Dr. Schupak, because a location just north of the city was selected by Hitler for Führerhauptquartier Wehrwolf, one of his eastern front military headquarters, in 1942-1943. Ruins remain of the small complex of buildings and bunkers constructed there, which were destroyed by the Nazis as they retreated from the area. The site is now part of a recreation zone. Pictured at right are the remnants of a bunker at Führerhauptquartier Wehrwolf one of the easternmost military headquarters used by German forces during World War II. The small complex at the headquarters site included a main house, officers’ quarters, barracks, bunkers, and observation points in trees. A Luftwaffe air base was located nearby. Photo: http://www.darrelllehman.com/ukraine/ukraine15/pages/ P4170077. html. Retrieved June 10, 2011. In response to a question, Dr. Schupak said that antisemitism is increasing in Ukraine. He attributed its growth to several factors. First, he said, is the influence of several rightwing politicians, particularly Oleh Tyahnibok of the nationalist All-Ukrainian Union Freedom Party. Through inflammatory rhetoric, Mr. Tyahnibok arouses “radical tendencies” just below the surface in many Ukrainians, stated Dr. Schupak. Second, continued Dr. Schupak, soccer hooliganism and similar mob action often includes antisemitic rhetoric. Third, he declared, the ease of using the Internet has provided a new vehicle for expression of anti-Jewish bigotry in general; in particular, he said, news stories about the financial successes of certain Jewish oligarchs spawn antisemitic commentary not only about the specific oligarch, but also about the Jewish people and about Israel. Another medium for the expression of antisemitism, commented Dr. Schupak, is vandalism in Jewish cemeteries; headstones may be toppled or defaced with swastikas. 15. Hesed Menachem, the JDC-sponsored welfare center, is centrally located in a large building constructed originally as a preschool. In the absence of Hesed Director Anatoliy Pleskachevsky, who was in Israel during the writer’s visit, several other hesed professionals were consulted. Some anxiety among staff was palpable as the hesed faces declining financial resources from year to year. JDC has terminated or sharply reduced some services to Jewish elderly, usually by tightening eligibility requirements so that fewer seniors qualify for specific benefits. In the meantime, the current building continues to deteriorate as the hesed is among the community institutions slated to move to the new Menorah Center as soon as it is completed. Obviously, it makes little sense to renovate a building that soon will be abandoned. The hesed maintains limited support services (such as issuing discount grocery cards) to about 7,000 elderly clients in Dnipropetrovsk and is a base for services to about 1,000 additional Jewish aged who live in nearby cities, such as Pavlograd and Dniprodzerzhinsk. Additionally, about 500 Jewish families receive welfare and other assistance to deal with poverty, psychological issues, vocational needs, legal problems, and childcare skills. About 120 special needs children rotate through the hesed in disability-related groups for recreational and socializing purposes. A distribution center at the hesed continues to loan medical equipment, such as wheelchairs and walkers, free of charge to those who need it. However, said staff members, a local factory that manufactures many such items recently declared bankruptcy and has closed. Replacing this local source of supply with another manufacturer inevitably will entail additional costs to cover transportation. They also noted that some items, such as therapeutic mattresses, can be used only by one person – for hygienic reasons – and are increasingly expensive to buy. Hesed Menachem continues to operate an adult day center, hosting groups of about 30 seniors who participate in a full day of activities twice each month. Participants are transported from and to their homes in private vans. They receive hairdressing services at the hesed, participate in various cultural activities, socialize with others, and eat breakfast and a warm noon meal. Some also consult with physicians and receive referrals to specialists, but staff noted that such medical consultations are less common than previously. 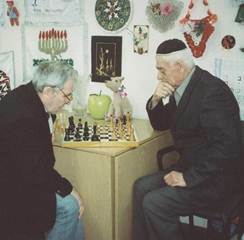 Hesed senior adult day care participants engage in chess, a favorite Russian pastime. On the wall behind them is the handicraft of current and past hesed clients. Concern was expressed about new tax legislation that closes loopholes in previous taxes imposed upon welfare payments and services. Recipients are liable if their yearly assistance equals 1200 Ukrainian hryvnia (approximately $263) annually in hesed services. Almost all clients receive more than this amount in a combination of discount food and medicine cards, hesed-based programs (such as the day care center), and/or patronage (homecare) ser-vice. Technically, the client should pay the taxes; however, fearing that many elderly will be unable to understand the regulations and/or afford the pay-ments, the hesed will submit payments for all clients. The new tariffs impose a heavy financial burden upon JDC, both in paying the taxes and in main-taining the infrastructure necessary to oversee the process. The name is derived from Werwolf (German for werewolf), but Hitler ordered it spelled Wehr, meaning defense (as in Wehrmacht). See pages 45-47 for an interview with Esther Katz, JDC director for the region. Rabbi Shmuel Kaminezki believes that all local Jews, including the infirm and elderly, should be comfortable in the new Menorah Center and has insisted that the hesed be located there. The approach of the Special Needs Educational Resource Center at Beit Chana is geared more toward education than toward recreation.